Meal planning is the advanced planning of a menu over a period of time; be it a few days, a week or even a month. For meal planning, you need to choose the meal, note the recipe and buy only the ingredients required for the meals chosen. There are many benefits of meal planning (which I will outline in a later post) but include ease of preparation of fresh homemade meals, getting the family to eat together, monitoring budget and saving on waste. It is also a helpful way to make sure that you and your family are eating a healthy balanced diet. My method of meal planning is to plan for the week. 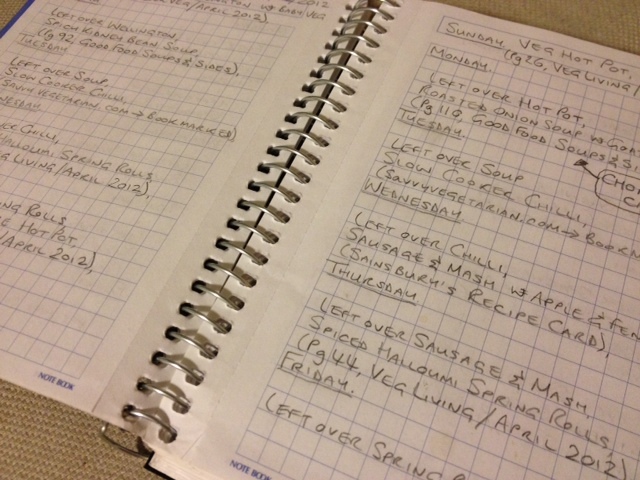 We sit down on a Saturday or Sunday with my book of meal plans and any cookery books/magazines we have around (usually seasonal magazines) and the laptop ready to choose some meals. It is exciting to plan the meals as you can get the whole family involved, making sure that everyone has a favourite each week. It might seem a little difficult when you first start meal planning as it can be hard to think of many meals at one time, but persevere! It will get easier and pay off in time. Sometimes, I look up menus from last year and use them when I am having a lazy or uninspiring week! I will be publishing my meal plans on this blog if you need a hand to get started. Filed Under: Blog, Uncategorized Tagged With: how to, meal plan, menus, money saving, what is it?